The Life Sciences Report: DURECT Corp. (DRRX:NASDAQ) released its Q4/17 earnings statement on March 1. The fourth quarter saw progress in commencing two Phase 2 trials for DUR-928. Please describe the compound and the indications you're targeting in these trials. Jim Brown: Before I directly respond, I�d just like to remind you that we are in a business that is inherently risky, so we recommend any potential investors to make sure they review the risk factors section of our SEC filings, including our recent 10-K, so that they understand the risks and uncertainties associated with our business. We are very excited about DUR-928. It is an endogenous small molecule, so it is in all of us. It acts at a very high level. We believe it's an epigenetic regulator of three areas of function within the body. The first is in lipid metabolism, which is how energy is used and moved around the body. The next is in inflammation. And lastly, it plays a role in regulating cell survival. We believe it's a stress hormone, and appears to be remarkably safe. It has a wide breadth of activity, and there are a lot of indications for which the molecule could be used. 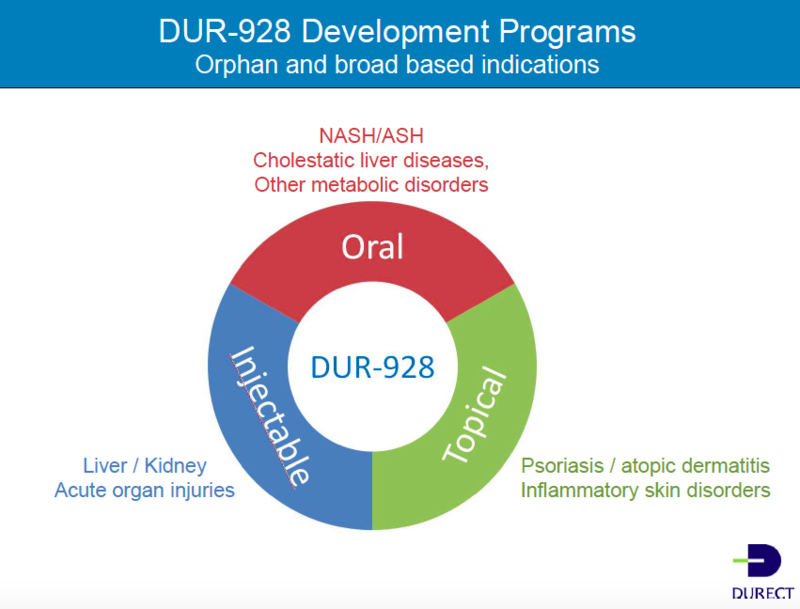 We're taking DUR-928 forward in three different programs right now: Orally, initially to treat primary sclerosing cholangitis (PSC) and eventually other chronic liver conditions, such as nonalcoholic steatohepatitis (NASH); by injection, initially for alcoholic hepatitis but we also expect it will be useful to treat other acute organ damage conditions, such as acute kidney injury; and last, topically, for psoriasis, where a topical may also be used for other inflammatory conditions such as atopic dermatitis. TLSR: Can you provide updates on the status of these trials and when you might expect them to read out? JB: Sure. For the PSC trial, we have started dosing. The trial will include 15 sites. We'll be dosing at two different levels and we expect between 30�40 patients to be in the trial. We're very fortunate in that this trial will have some clear biomarker readouts in alkaline phosphatase, in bilirubin, and also in some markers of cell death called cytokeratin (CK-18, full and cleaved length). It's an open-label trial, so we expect to be able to get a readout later this year. In the second trial, for alcoholic hepatitis, we're setting up a number of sites right now. We'll be dosing three different doses, and will include 24-36 patients in total. We'll be looking at the model for end-stage liver disease (MELD) score. The MELD score is what a physician uses to look at how well the patient is doing and how well the liver is functioning. Depending on the level, the physician can get a sense of survival for the patient. The three components that go into the MELD score are levels of bilirubin, creatinine, and prothrombin time. We have demonstrated in animal models and in human patients that we've reduced bilirubin. We have seen creatinine drop in an animal model of kidney disease. So we're hopeful DUR-928 is going to be able to help patients. This is also an open-label trial, so we also hope to get data this year. The last Phase 2 trial we'll start this year is topical application of DUR-928 for psoriasis. We expect the trial to start in Q3/18, with data either late this year or early in 2019. TLSR: Many players are developing products to treat liver disease, and the NASH market is pretty crowded. How is DUR-928 differentiated from other products in development? JB: First of all, NASH is a huge problem in the United States. It's a major issue in health care in general, as is liver disease. I think about a third of Americans have nonalcoholic fatty liver disease and somewhere in the range of around 10% of those patients go on to develop NASH. Chronic liver disease can also present itself in the form of ASH (alcoholic steatohepatitis). Quite frankly, across America, the majority of patients with this type of liver disease probably don�t have pure NASH. They more likely have a combination of overeating and alcohol creating the liver problem. We are focusing on PSC first, where we think there's an opportunity to help patients in this orphan disease. But later, we expect that our molecule DUR-928 may also help NASH patients. We feel that way because of the breadth of the activity of this molecule has demonstrated in various nonclinical studies. Almost every company pursuing a therapy for treating NASH is looking to combine molecules to truly treat the condition. The three areas of activity they are looking to combine are the regulation of metabolism, the inflammatory response, and in keeping the cells alive, reducing cell death. We're very fortunate with DUR-928 to have a molecule that works in all three of these areas. It's the breadth of activity that strengthens the opportunity for DUR-928. We have some very compelling data from NASH patients after a single dose. We've seen reductions in markers of cell death, from 33% to as high as 47% from a single dose. We've seen something I've not seen any other molecule demonstrate, and that is a reduction in bilirubin by approximately 30% after a single dose. I'm not aware of any other molecule that has a direct effect like that on bilirubin. That's very important for functionality of the liver and reads through to the MELD score. If you've ever known anyone who has chronic or even acute liver disease, when they have the jaundice�the yellowing of the eyes and the like�that shows the dysfunction of liver cells' ability to clear bilirubin. The fact that we impact lipid metabolism, inflammation and cell survival are key. If one looks at treating NASH, the greatest opportunity on the medical side is in treating later-stage patients�patients who have fibrosis leading to cirrhosis, who are progressing to the end-of-disease state. Earlier-stage patients can be treated by lifestyle changes and the like, are much more difficult to find and to diagnose, but later-stage patients are the ones who desperately need help. With DUR-928, the more progressed the disease state in the animal models that we�ve tested, the greater the results. We've also seen this in the NASH patients, and in the chronic kidney disease single-dose study, where the higher the bilirubin and CK-18s were prior to treatment, the greater the effect of DUR-928 to reduce them. TLSR: Back in February, DURECT hosted a call with a key opinion leader about treatment of PSC. Can you describe the takeaways from that meeting? JB: Absolutely. The first one was that PSC is an orphan disease and it's probably underdiagnosed. Second, it's a very serious disease and can lead to the need for liver transplant. Lastly, patients can also end up developing either hepatocellular carcinoma or carcinoma of the bile duct. There are no existing treatments, so there's a clear need for a drug in this space. Also, there's been an emergence of biomarkers that can predict outcomes. The two important ones are stiffness of the liver, caused by fibrosis, and also the enzyme alkaline phosphatase or ALP. Normalization of ALP is very important. The nice thing about this study is we don't have to rely on liver biopsies, which can be dangerous and challenging for patients to undertake. Hopefully, the FDA will come to recognize these as biomarkers predictive of outcomes for the disease. TLSR: Do you think the fact that PSC has these various aspects of an orphan disease could accelerate an FDA approval? JB: I think if we have the effect that I just described. . .we shall see. Current potential therapies have dropped ALP 10�25%. If we can see more than that with DUR-928�if we can move toward normalization and move the alkaline phosphatase into the normal range�I think that might accelerate approval. TLSR: Can you describe the financial and balance sheet highlights from your quarterly report? Matt Hogan: Sure. We ended the year with about $37 million in cash, which is easily more than one year's burn rate, so that we can continue to invest in this pipeline. We also recently amended our debt to push back any principal payments by three quarters. Also, as a reminder, we have two PDUFA dates coming up for products that we've outlicensed. If those products are approved, we could earn $6.5 million in milestone payments in Q3/18. In addition, if they're approved, that sets up future royalty payments or earn-out streams coming into the company. We feel pretty good about our financial position at the moment. TLSR: Can you provide updates on your other pipeline products? We can start with Remoxy�, a tamper-resistant opioid alternative that you have partnered with Pain Therapeutics Inc. (PTIE:NASDAQ). JB: Remoxy is an abuse-deterrent version of oxycodone. Even though there's a huge problem in the U.S. with narcotic abuse, there are a large number of legitimate patients who desperately need pain control, and oxycodone is a good product for that. I think sales today are close to $2 billion for extended-release oxycodone. The Remoxy PDUFA date is now set for August 7. The main new information added to resubmission of the new drug application was a positive trial looking at reduction of the abuse potential of the Remoxy ER product versus other products on the market today. So if we gain approval, there would be a $1.5M milestone, and then we would receive a royalty of 6 to 11.5%. TLSR: How about RBP-7000 for schizophrenia? Can you describe what that compound offers and where it stands in the process? JB: Sure. RBP-7000 is being developed by Indivior Plc (INDV:LON). The PDUFA date is July 28, a little before Remoxy's PDUFA date. The product is a once-a-month injectable for treatment of schizophrenia, and that's an important component. Compliance in schizophrenics is oftentimes a challenge, because when they're on their oral meds�or on their meds in general�they're feeling better. They can get to a point where they don't feel they need to continue the meds, and then they slip back into a bad place. Family members may end up having to help them get back to their physician. The nice thing about an injectable product is it ensures compliance. You have an injection once a month, and you go forward. The good fortune with RBP-7000 is that it's a true once-a-month dosing. It has a very rapid onset of action, so there's no loading dose required on initial treatment. There's no supplemental dose required with an oral product. And RBP-7000 has demonstrated really nice efficacy in the treatment of schizophrenia during clinical trials. On approval, we would receive a $5M milestone, and we get a single-digit earn-out on net sales in the U.S. And Indivior just recently announced it set up a separate business unit to launch the product. It expects to launch RBP-7000 in Q4/18, and Indivior has projected peak sales somewhere between $200�300M. TLSR: In a recent research note, one analyst commented that given the PDUFA date for Remoxy in August and RB-7000 in July, as well as data readouts for DUR-928, 2018 was going to be a pivotal year for DURECT. Is that how you see it? JB: Absolutely, yes. We have the great fortune of having lots of news flow this year, and we could reach these important proof-of-concept studies for DUR-928 in a couple of different approaches: with the oral treatment for PSC; with the injectable for alcoholic hepatitis; and then a little farther along, with the topical treatment for psoriasis. Any one of those could lead to a substantial inflection in value of the company. TLSR: Is there anything else you'd like us to know about DURECT's trajectory as we move into Q2/18�and all of 2018? JB: I would add that we also have the great fortune of our legacy products, which are getting close to market�with RBP-7000 and with Remoxy. Both of those present wonderful opportunities for us as well. But beyond that, and I think the reason investors should look very hard at DURECT, is DUR-928. It's a unique molecule that represents a pipeline all unto itself. There's a lot to look forward to with the Phase 2 readouts coming this year. TLSR: Thank you, Jim and Matt. James E. Brown, D.V.M., cofounded DURECT in February 1998 and has served as president, CEO and a director since June 1998. He previously worked at Alza Corp. as vice president of Biopharmaceutical and Implant Research and Development from June 1995 to June 1998. Prior to that, Dr. Brown held various positions at Syntex, a pharmaceutical company, including director of business development from May 1994 to May 1995, director of joint ventures for discovery research from April 1992 to May 1995, and a number of positions including program director for Syntex Research and Development from October 1985 to March 1992. Dr. Brown holds a bachelor's degree from San Jose State University and a D.V.M. (Doctor of Veterinary Medicine) from the University of California Davis, where he also conducted post-graduate work in pharmacology and toxicology. Matthew J. Hogan joined DURECT from Ciphergen Biosystems, where he was the chief financial officer from 2000 to 2006 and a consultant from March 2006. Prior to joining Ciphergen, Mr. Hogan was the chief financial officer at Avocet Medical from 1999 to 2000. From 1996 to 1999, Mr. Hogan was the chief financial officer at Microcide Pharmaceuticals From 1986 to 1996, he held various positions in the investment banking group at Merrill Lynch & Co., most recently as a director focusing on the biotechnology and pharmaceutical sectors. Mr. Hogan holds a B.A. in economics from Dartmouth College and an M.B.A. from the Amos Tuck School of Business Administration. 1) Tracy Salcedo conducted this interview for Streetwise Reports LLC and provides services to Streetwise Reports as an independent contractor. She owns, or her family owns, securities of the following companies mentioned in this interview: None. She is, or members of her immediate household or family are, paid by the following companies mentioned in this article: None. 2) DURECT Corp. is a billboard sponsor of Streetwise Reports. Click here for important disclaimers. The information provided above is for informational purposes only and is not a recommendation to buy or sell any security. 3) Jim Brown and Matt Hogan had final approval of the content and are wholly responsible for the validity of the statements. Opinions expressed are the opinions of interviewees and not of Streetwise Reports or its officers. 4) Jim Brown: I was not paid by Streetwise Reports to participate in this management interview. I had the opportunity to review this for accuracy and am responsible for the content. I or my family own shares of the following companies mentioned in this discussion: DURECT Corp.
5) Matt Hogan: I was not paid by Streetwise Reports to participate in this management interview. I had the opportunity to review this for accuracy and am responsible for the content. I or my family own shares of the following companies mentioned in this discussion: DURECT Corp.
6) Discussions are edited for clarity. Streetwise Reports does not make editorial comments or change experts' statements without their consent. 8) From time to time, Streetwise Reports LLC and its directors, officers, employees or members of their families, as well as persons interviewed for articles and interviews on the site, may have a long or short position in securities mentioned. Directors, officers, employees or members of their immediate families are prohibited from making purchases and/or sales of those securities in the open market or otherwise from the time of the interview or the decision to write an article, until one week after the publication of the interview or article.